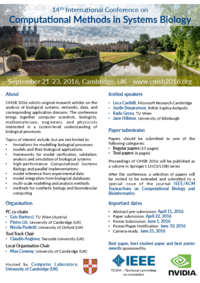 The 14th conference on Computational Methods in Systems Biology (CMSB2016) will take place on the 21st to 23rd September 2016 in Cambridge. Its aim is to bring together researchers from across biological, mathematical, computational and physical sciences who are interested in the study and modelling of biological systems. CMSB2016 will be hosted at Cambridge University Computer Laboratory. IEEE TCSIM best poster award goes to: David Shorthouse, Angela Riedel, Jacqueline Shields and Benjamin Hall, "Deregulation of Osmotic Regulation Machinery Explains and Predicts Cellular Transformation in Cancer and Disease"
IEEE TCSIM best student paper goes to: Michael Backenköhler, Luca Bortolussi and Verena Wolf, "Generalized Method of Moments for Stochastic Reaction Networks in Equilibrium"
NVIDIA best paper award goes to: Eugen Czeizler, Cristian Gratie, Wu Kai Chiu, Krishna Kanhaiya and Ion Petre, "Target Controllability of Linear Networks"
6 September 2016: Proceedings are available online. 14 September 2016: ARSBM 2016 will be co-located with CMSB 2016. 26 August 2016: The social event will be dinner at Emmanuel College. 12 Jul 2016: Conference program is out. 12 Jul 2016: Registration is open. 27 June 2016: Accepted contributions have been announced! 23 Feb 2016: Special issue on IEEE/ACM Transactions on Computational Biology and Bioinformatics announced (see call for papers). 15 Feb 2016: Awards!!! Best paper award sponsored by NVIDIA. Best student paper and Best poster awards sponsored by IEEE Technical Committee on Simulation (see call for papers and call for posters). 2 May 2016: Microsoft Research is one of our sponsor! 16 Apr 2016: Deadlines extended!!! 2 more weeks for submitting a paper and 1 more week for submitting a poster to CMSB. See call for papers and call for posters. 29 Mar 2016: Updated submission format for regular papers (now the limit is 15 pages). See call for papers. 18 Mar 2016: Check out CMSB Twitter and Facebook pages! 16 Mar 2016: Second call for papers and call for posters published. 18 Sep 2015: CMSB 2015 finishes.